LAHORE: Thousands of Jamaatud Dawa (JuD) activists converged on The Mall on Thursday to mark Pakistan Day, exposing the government’s hollow claims of snuffing out hate speech. Under the leadership of Hafiz Abdul Rehman Makki, the JuD held its rally from Minar-e-Pakistan to Istanbul Chowk, where its leaders delivered fiery speeches against the government for detaining its co-founder Hafiz Saeed. Most of the speakers also condemned Prime Minister Nawaz Sharif for participating in Holi celebrations with the Hindu community and his vision of treat all religious minorities equally. 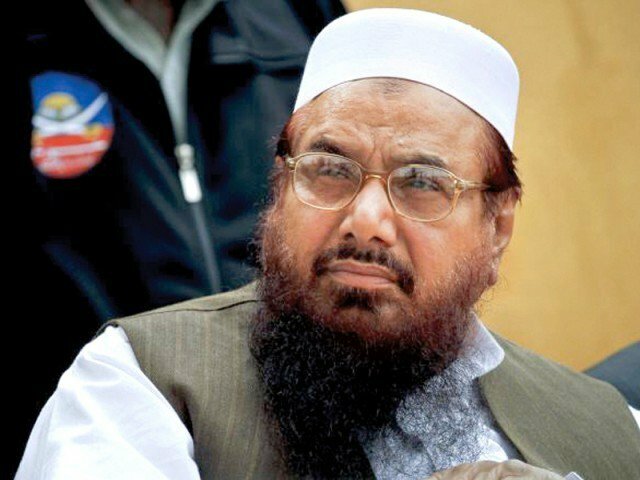 JuD and its charitable wing Falah-e-Insaniat Foundation have been included on the terror watch-list for ‘harming peace and security’ and being involved in activities against international regulations. On January 30, JuD chief Hafiz Saeed from Lahore, Abdullah Ubaid in Faisalabad), Zafar Iqbal and Abdul Rehman Abid from Muridke and Kashif Niazi of Multan were put under house arrest for 90 days. Despite being included on the terror watch-list and detention of its leaders, the JuD managed to put up a massive show of strength in the heart of Lahore. The rally participants were facilitated by police, who barricaded the roads for traffic. Azadi flyover was closed for traffic to facilitate the activists assemble on it before leaving for Istanbul Chowk. On The Mall, the organisation was allowed to install a huge stage and arrange a large number of chairs for the participants. Published in The Express Tribune, March 24th, 2017. “Facilitated by Police” says a lot! Same kind of crack down raud -fasad doing.